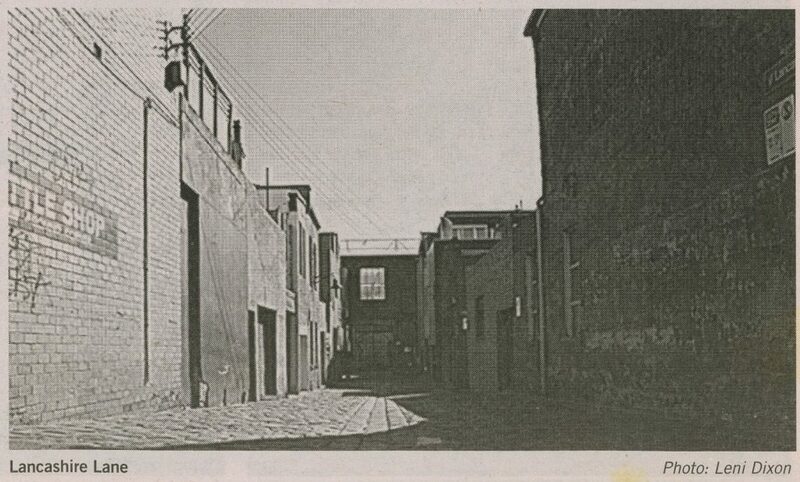 In 1855, what is now North Melbourne was the Hotham Ward of the municipality of Melbourne in the Colony of Victoria. Although we now say 'Hotham' with the `th' as in 'thing', the governor whose name was used would almost certainly have pronounced his name with a 't'. The Public Record Office Victoria in Shiel Street holds the Hotham rate books for that and following years. Recently, I went to look at them. To see the old records as they were and still are is a reminder that history is more than facts. The books have a real presence. They are large and bound in leather. Entries are handwritten in ink with occasional pencilled notes and lists of the amounts to be paid, half in May and the rest in October of the same year. The pages are neatly written with very few corrections and no blots. The order in which the streets appear, which sometimes seems a bit hard to follow, is easier when you realise that it is the route taken by the council official as he walked along making notes that were later finalised and copied into the rate book. By 1855, there were familiar names among the ratepayers. 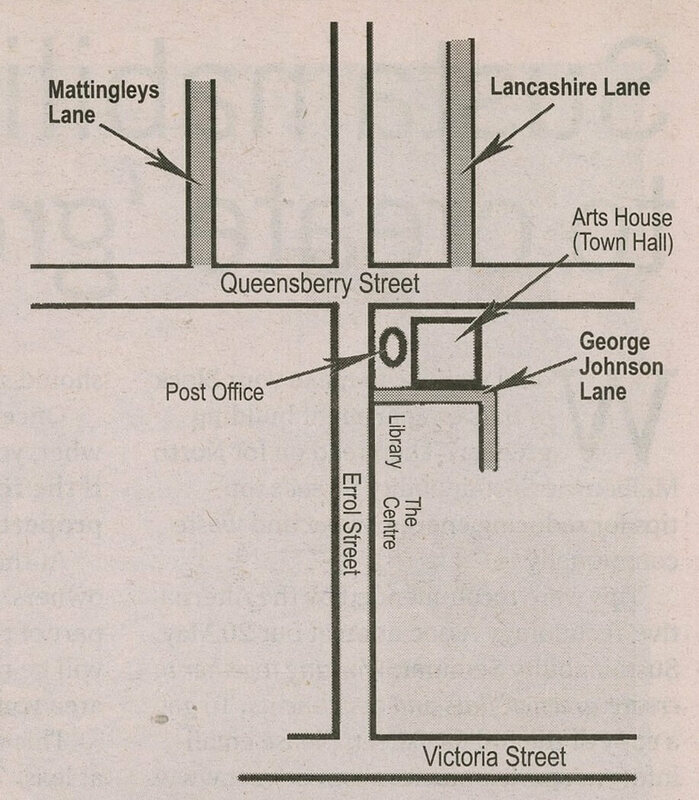 John Mattingley, whose wife and son later founded the North Melbourne Primary School, already owned and paid rates on a house and shop in Errol Street. 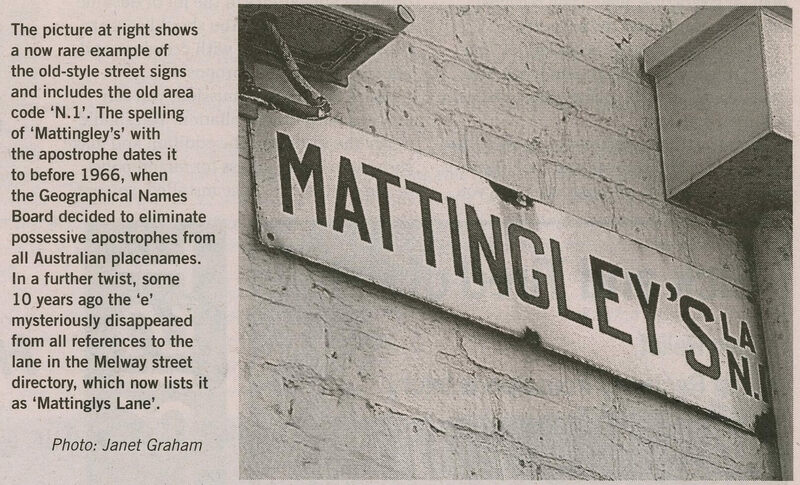 In the years to come, Mattingley's North Melbourne-born grandson established the Gould League of Bird Lovers and had a mountain named after him, but the family name would also be preserved in Mattingleys Lane, off Queensberry Street. Samuel Lancashire, after whom the lane opposite today's Arts House is still named, was also there in 1855, paying rates on his shop in Queensberry Street. He went on to be a long-term owner of the Court House Hotel, mayor of the municipality of Hotham in 1869 and a Life Governor of the Benevolent Asylum. Some of the hotels we see today were already open for business in 1855. They included The George in Victoria Street and the Edinburgh Castle, which still bears its full name on the wall above the street though it has been rebadged The Castle. I was most interested to see that the 1855 entries give some details about the buildings that were there at the time. Few of the actual buildings have survived — they were built in the gold rush and served immediate needs. Most of the houses were of wood. Many were two rooms, sometimes with an added kitchen, and there were quite a number of stables. I noted a few zinc houses, some iron houses and a slate house. In 1855, but seemingly not in later years, some tent grounds are identified. One — in Leveson Street — had five tents on it. Others in Arden and Wreckyn streets had some sort of a house as well as a tent ground, but there is no indication of how many tents were there. In Flemington Road, close to Harcourt Street, a Felix McCane is noted as being required to pay rates on land where there was a framed tent. The rate books of successive years reflect how the area grew as houses, factories and businesses were set up, and the shapes and characters of streets were established. However, the real character of the North Melbourne we know today was established in 1875 when the present town hall replaced its modest predecessor, and a decade later the library and adjacent shops were built. Ever since then, this stand of buildings has graced the street and earned its reputation as one of the finest examples of Victorian architecture to have survived intact into the 21st century. Over several generations, the clock tower has meant home to many a North Melburnian and over that time, too, the adjacent library has been a focal point of local life. Though they were built over a period of about 10 years, all of these buildings — which at the moment are swathed in protective black cloth were designed by the same man. Some luck was involved in his getting the first job, that of designing the town hall. Council's choice of architect was supposed to be the result of a competition, but when the winner, George Johnson, was announced, the decision was disputed by several of the councillors who had been involved in the vote. An account of what seems to have happened is contained in Pride of Hotham, Bill Hannan's story of the town hall and its architect. The controversy died down and George Johnson rather than his colleague Flanagan, who designed the first town hall kept the job. Its success would have contributed to his selection as architect for the library and shops, whose rent was intended to improve the council's income. 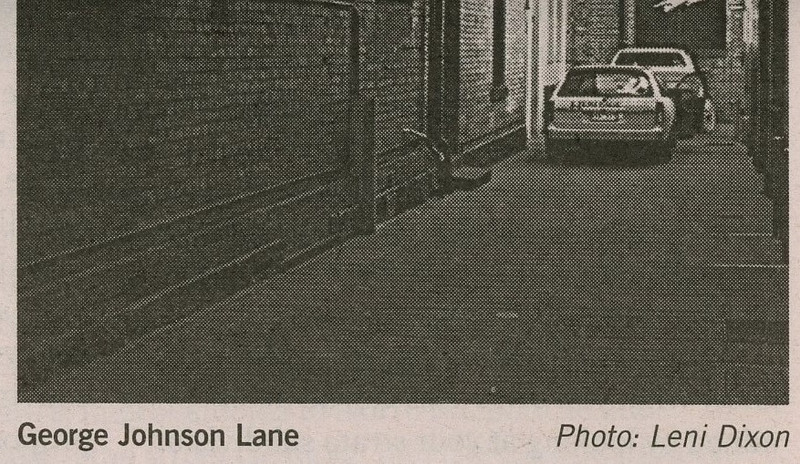 In our own time, Johnson's name has been given to the lane running off Errol Street between the post office and the library. This in some way makes up for the fact that there is no other public recognition of his work in Errol Street. It seems unfortunate that, although a foundation stone was put in place when the town hall was built, no one now knows or has been able to find out where it is. If there was an inscription on the stone, no one has been able to establish what it said. Whatever the misfortune was, it continues. When the library and shops were built some years after the town hall, the records of the time tell us that there was another foundation stone laid but once again its whereabouts are not known. Johnson is best known today for his town halls, most of which — with the exception of our own carry his name on a foundation stone or plaque. Fitzroy, Collingwood, Northcote, Daylesford, Maryborough and Kilmore are all his work. In his own day, Johnson would have been better known for his theatres. He designed one in every colony. These are now all gone but his multipurpose town halls, as the name suggests, usually included a large entertainment space alongside council offices, post offices and courthouses, and the halls continue to be used as theatres even though the other town functions have moved elsewhere. One reason for their continuing use, of course, is that the buildings have heritage protection. North Melbourne Town Hall has been threatened in the past with demolition or privatisation, but it has survived. 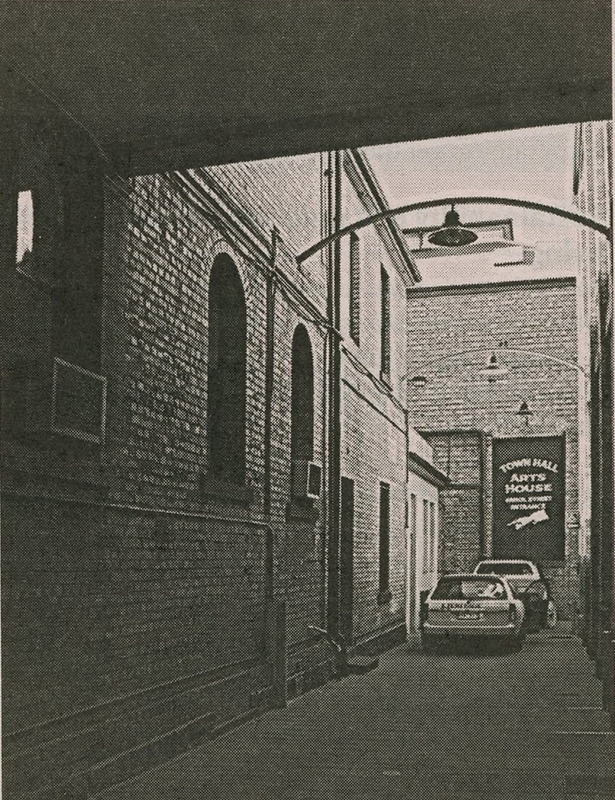 So too has Johnson's other grand contribution to North Melbourne, the Meat Market, which a heritage listing saved just before the auction. The building continued through a distinguished period as a craft centre and has now joined Johnson's other buildings as a theatre. Fortunately, the Meat Market does have a foundation stone on which George Johnson gets due credit. by Lorna Hannan, chair of the Hotham History Project, 2009.